The 2017 Card - Six Flowers are back!! The only change in the categories is from 2016 to 2017 and Eleven Hands are now "Lucky 13". The pung, pung, kong, kong pattern has changed back to pung, kong, pung, kong, and the pair, pair, pung, pung, kong has changed back to pair, pung, kong, pung, pair. These patterns have alternated from year to year and this was not unexpected. There is a pair, pair, pung, pung, kong pattern in 2468, Consecutive Run, 13579 and 369. An example of this is the 11 22 111 222 3333 hand, which has been retained. Some changes: No wind/year hand combination this year. Second hand pair of flowers, kong of dragons, 2017, kong of dragons in second suit. Third hand is something new - pair of flowers, followed by 2017 and two kongs of sevens; 3 suits. The fourth hand is closed and is the same as the current closed hand except the last pung is sevens. Pay close attention here! Many hands look the same, but they are not! The first hand is now a kong of flowers, single two, pair of four, pung of sixes and kong of eights. Second hand pattern changes to pung, kong, pung, kong. The three kongs of 2-4-6 with the pair of eights in one suit has been retained, as has the hand above it on the 2016 card. The hand with the two pairs of eights is out, and the closed hand with dragons is out. The closed hand is a pair of flowers followed by four pungs each of 2468. Like numbers has been shaken up a bit. Still only two hands. First hand three suits; pair of flowers, kong of number, kong of dragon, kong of like number. This may take a bit of getting used to. Second hand a six flower hand. Pung of flowers, kong of number, pung of flowers, kong of like number. Open hand, value 30. Makes those flowers way more valuable, IMHO. Fours and nines, fives and eights, sixes and sevens, all add up to 13. Hang on to those flowers and sevens when and if you want to go joker shopping! My old favorite in first place: Quint any wind, kong any dragon, quint any number. Second place like numbers - quint, kong, quint. Fairly straightforward. Third place: Consecutive run. Pair of flowers, quint, pair, quint, any three consecutive, one suit; i.e., FF 11111 22 33333. This substitutes for that infernal FF 11111 66 77777 hand which I never made. The classic first hand is now pair, pung, kong, pung, pair. 11 22 111 222 3333 is RETAINED! Kong of flowers, one suit consecutive run kong with pair of matching dragons is BACK! The sandwich hand is RETAINED! (Kong pair/pair/pair kong) Some call it bookends. The Margaretann hand is BACK! I mean, the closed hand, pung-pair-pung consecutive with two pungs of opposite dragons - value 30. Margaretann played it (and made it) often. Consecutive runs now seems like a haven of classic, cherished hands. First hand is now pair, pung, kong, pung, pair. 1-3-3-5 and 5-7-7-9 is now pung, kong, pung, kong. The one-nine bookends with pairs of 3-5-7 has been retained. The dragon hand in odds now fits the pattern of the dragon hand in evens. Three suits: 11 33 333 555 DDDD or the same in 5-7-9-D. More sevens! Flowers and odds has changed to pair of flowers, kong each of 1-3-5 or 5-7-9. Another pattern hand is next: 11 33 111 333 555 (3 suits), same in 5-7-9. The closed hand is different yet familiar: 111 3 555 555 7 999. Only 1 seven in this one. A little fun with winds and dragons. First hand is the same, kongs of N-E-W and pair of souths. Second hand is a sandwich: Kong of norths and souths with pairs of dragons in the middle. The hand comes in easts and wests as well. 30 points. Next hand is - aha! - another six flower hand. Can be done in North/South or East/West. Pung of flowers, kong of wind, pung of flowers, kong of wind. And the last hand is a switch from a kong of flowers to a pair of flowers with three kongs of dragons. Not a whole lot of change for this category, although the closed hand looks interesting. The one suit dragon hand is now: Kong of 3, pair of six, kong of nine, kong of dragons. No flowers. Second hand has conformed to pattern in other categories: pung, kong, pung kong of 3-6-6-9. The third hand is retained. Pair of flowers, kong each of 3-6-9 in one or three suits. Fourth hand retained in same position. Conforms to pattern; pair, pair, pung, pung, kong. 3-6-3-6-9. Fifth hand tweaked and instead of like pungs it's now in three suits. Pair each of 3-6-9 and kongs of 3, 6, or 9 in the other two suits. The final, closed hand is something new. Two flowers, pung of 3, pung of 6, then pung of 9 in second suit and pung of 9 in third suit. Something old, something new in singles and pairs. Wind hand is pairs of all winds and pairs of like numbers. Consecutive run hand is seven pairs, any consecutive numbers in one suit. (There are only three possibilities for this hand - 1 through 7, 2 through 8 or 3 through 9) I actually made this hand last week - too bad it wasn't on the card yet! The 369 pairs hand has been retained. The evens pairs hand has been brought back: pair of flowers, two suits of 224688. Odds pairs hand is pairs of 13579 with like odd pairs in opposite two suits. 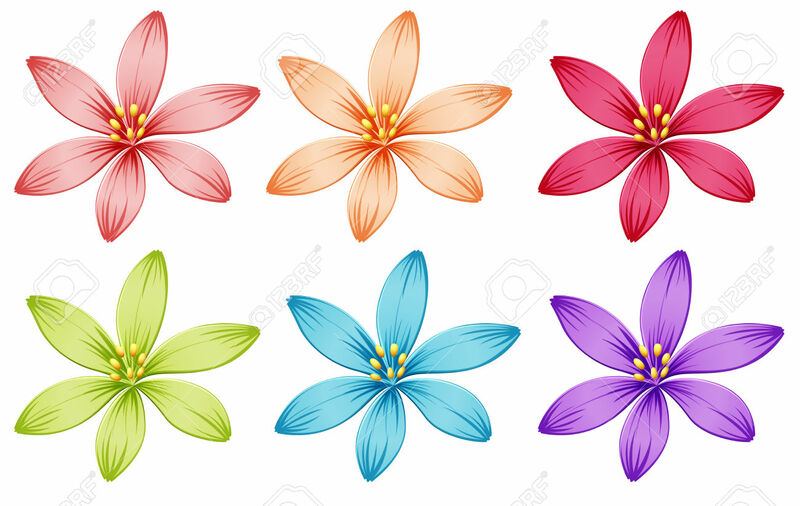 The pair of flowers with pairs of consecutive numbers is retained; i.e., FF 11 22 11 22 11 22. So there you have this year's card - something for each one of the League's hundreds of thousands of members. Can't wait to play! The National Mah Jongg League RULES. The League will shortly give the word for the new 2017 card to go out. This is a time of great anticipation among the membership as we eagerly await the new configuration of the hands. But it is not only the hands that we receive, it is the Rules, which are printed on the back of the card and demarcates the National Mah Jongg League as the rulemaking body for National Mah Jongg League mah jongg. 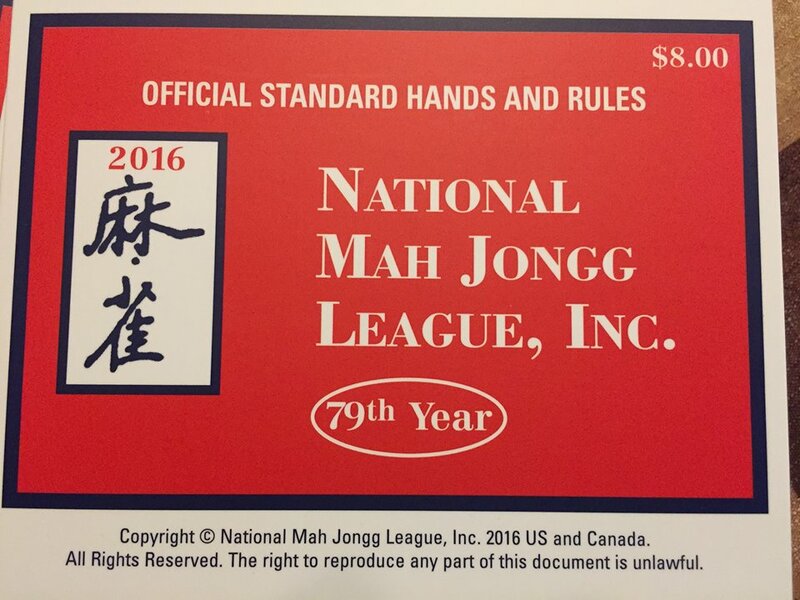 The rules set forth by the National Mah Jongg League provide the basis for all games played with the National Mah Jongg League card. These rules can be found on the back of the card and in the rule book "Mahjongg Made Easy (2013)," which is sold by the League. There are also rule books that have been published and available online, most notably Tom Sloper's "The Red Dragon and the West Wind." The League sends a newsletter to members in early January containing answers to questions about rules. The newsletter also contains rule updates, so it is a good idea to read the Q/A section, as some rules may change. If you do decide to buy a rule book, note its publication date - some rules may have changed since it was written. Tournaments are played around the country and while they use the NMJL card and play by the official rules, tournament directors have the discretion to add rules that are unique to tournaments. These rules are implemented as a way of calculating points, or in an effort to eliminate cheating. Some notable tournament rules are: -10 points if you look at a blind pass; +10 points for a wall game; minus points if you throw to a second exposure and minus even more if you throw to a third exposure. Most tournaments now have adopted the rule that you must place a called tile on top of the rack and not in the rack. Because these rules vary from the official rules and they vary from tournament to tournament, they are usually spelled out in a rules sheet provided to each player. Any disputes are mediated by the tournament director and not the National Mah Jongg League. And then there are table rules. I get many e-mails from players who are told by "experienced" players that they must pay for the table if they throw to three exposures. Some players learned that tapping a tile on the rack is the equivalent of racking. Some players have never stopped playing with 14 tiles. And while there is nothing so terrible about playing this way, it should be understood by all who play that these are not official rules, but rules agreed upon by the house, or by the table. Table rules should also be spelled out clearly before the game starts, so as to avoid disputes. 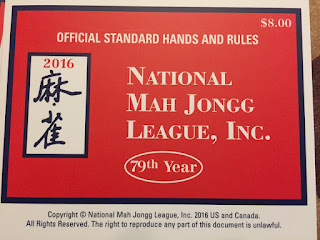 But in order to know whether you are playing with a table rule, you need to know which rules are the "real" rules promulgated by the National Mah Jongg League as the standard by which to play. As many of you will know, the League suffered a great loss in 2015 with the passing of president Ruth Unger and treasurer Marilyn Starr, beloved women who formed the core of the association. In the last year-and-a-half, Larry and David Unger have worked tirelessly to uphold the standards that we have come to know. This meant finding members to serve on the rules committee, write the new card and issue rulings both over the phone and by mail; not an easy task by any means. In the next few weeks, the card will come and we'll all hunker down and learn it using the rules of the League. The League stands ready to answer your questions and work to ensure that for the next 365 days we get our $8 or $9 worth of enjoyment and comaraderie playing the game we love. Bring it on!